If other Bank schemes, like Funding for Lending or quantitative easing were overwhelming the market then we’d expect the spread to be lower than usual, not much higher. His second big point, that the spread between the Bank Rate and the rates banks charged on markets couldn’t narrow any further 2009 onwards perplexes me. On the one hand, it is effectively an illustration of my general principle that markets set rates—rates are being determined by banks’ considerations about their bottom line, not Bank Rate moves. On the other hand, it seems internally inconsistent. If banks make money (i.e. the money they need to cover the fixed costs Julien mentions) on the spread between Bank Rate and mortgage rates (i.e. if Bank Rate is important in determining rates, rather than market moves) then the absolute levels of the numbers is irrelevant. It’s the spread that counts. It looks to me that we are both misunderstanding each other here. It is indeed the spread that counts. But the spread over funding (deposit) cost, not BoE rate! (Which seems to me to be consistent with my posts on MMT/endogenous money.) Let me clarify my argument with a simple model. A medium-size bank’s only assets are floating rate mortgages (loan book of GBP1bn). Its only source of revenues is interest income. The bank maintains a fixed margin of 1% above the BoE rate but keeps the right to change it if need be. The bank’s funding structure is composed only of demand deposits, for which the bank does not pay any interest. As a result, the bank has no interest expense. The bank has a 100% loan/deposit ratio (i.e. the bank has ‘lent out’ the whole of its deposit base and therefore does not hold any liquid reserve). The bank has an operational cost base of GBP20m that is inflexible in the short-term (not in the long-term though there are upwards and downwards limits) and no loan impairment charge. Of course this situation is unrealistic. A 100% loan/deposit bank would necessarily have some sort of wholesale funding as it needs to maintain some liquidity. It would also very likely have a more expensive saving deposit base and some loan impairment charges. But the mechanism remains the same therefore those details don’t matter. with f(BoE rate) = BoE rate + margin = BoE rate + 1%. Consequently, in order for Net Profit > 0, we need f(BoE rate) > Costs. Now, we know that the bank’s cost base is GBP20m. The bank must hence earn more than GBP20m on its loan book to remain profitable (which does not mean that it is enough to cover its cost of capital). and f2(BoE rate) = BoE rate – margin = BoE rate – 2%. 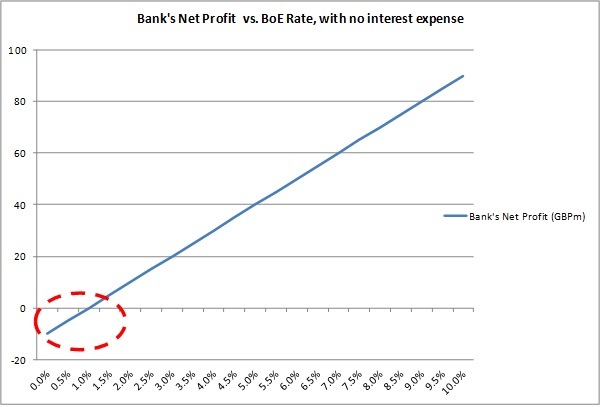 The equation can be reduced to: Net Profit = 3% (of its loan book) – Costs, as long as BoE rate >= 2% (see below). What happens is clear. Independently of its effects on the demand for credit and loan defaults, the BoE rate level has no effect on the bank’s profitability. Everything changes when deposit rates reach the zero lower bound (i.e. there is no negative nominal rate on deposits), which occurs before the BoE rate reaches it. From this point on, the bank’s interest income decreases despite its funding cost unable to go any lower. This is the margin compression effect that I described in my first post. In reality, things obviously aren’t that linear but follow the same pattern nevertheless. Realistic banks are also funded with saving deposits and senior and subordinated debt, on which interest expenses are higher. 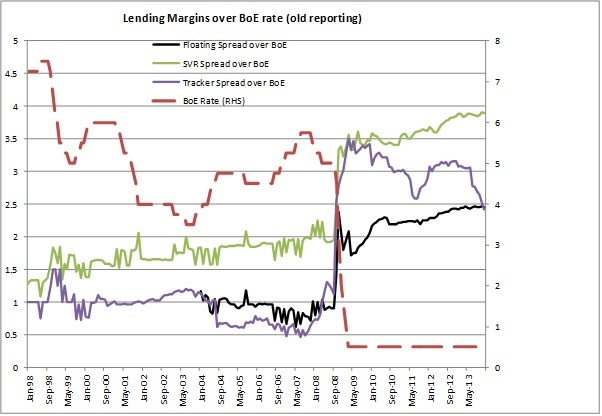 This is when schemes such as the Funding for Lending Scheme kicks in, by providing cheaper-than-market funding for banks, in order to reduce the margin compression effect. The other way to do it is to reflect a rate rise in borrowers’ cost, while not increasing deposit rates. This is highly likely to happen, although I guess that banks would only partially transfer a rate hike in order not to scare off customers. Overall, we could say that markets determine mortgage rates to an extent. But this is only due to the fact that banks have natural (short-term) limits under which they cannot go. It would make no sense for banks not to earn a single penny on their loan book (and they would go bust anyway). Beyond those limits, the BoE still determines mortgage rates. Although I am going to qualify this assertion: the BoE roughly determines the rate and markets determine the margin. At a disaggregated level, banks still compete for funding and lending. They determine the margins above and below the BoE rate in order to maximise profitability. They, for instance, also have to take into account the fact that an increase in the BoE rate might reduce the demand for credit, thereby not reflecting the whole increase/decrease to customers as long as it still boosts their profitability. Those are some of the non-linear factors I mentioned above. But they remain relatively marginal and the aggregate, competitively-determined, near-equilibrium margin remains pretty stable over time as demonstrated with the first chart above. With this post I hope to have clarified the mechanism I relied on in my previous post, but feel free to send me any question you may have! The data above shows that interest rates have no affect on bank profitability historically. Jake, that blog post is a little misleading. As I explained, the level of interest rate is indeed irrelevant to the net interest margin….until funding costs reach the zero lower bound (and as long as they don’t turn negative). Such low nominal interest rate levels have never happened in history, so we can’t look at historical data. It’s just pure accounting. Interest income declines, interest expense cannot decline anymore, so the spread between them mechanically tightens. UNLESS credit risk increases, in which case the credit risk component of the interest rate on loans is going to increase, which can hide the decline of the risk-adjusted margin (and it is a mistake of the post you linked to not to take into account fluctuations in credit risk). Also, I don’t see why bankers would consistently complain about the low interest rate environment if indeed the nominal level of rates had no impact whatsoever on their profitability. In such a case, they should always demand lower rates (to lower the risk of default). When rates remain above a certain threshold, we don’t hear bankers complaining, for the reason I explained in my various posts. Bank creates a loan,then secures funding from retained deposits / money markets. the bank places an interest rate margin to meet costs and profit on top of the libor rate. so the bank secures the funding,is charged at the libor rate,(shouldn’t the BoE rate be more expensive). Say it costs the bank 0.80 and they are lending at 4%…that’s an income margin of 3.20%.Say 1.20% goes to meeting bank costs and 2% is pure profit. Banks make the case for higher BoE rates (which in turn affects libor,something else I would appreciate if you could explain). So the BoE is increased up to 1.50%…the libor rate goes up to 1.80. So the bank charges at 5%.,leaving it with 3.20% income and it splits cost /profit 1.20% to 2.00% again. I get that I’m missing something that is really obvious to you,I’m just really struggling to see it. Like you say ,low rates (for consumers/businesses) should engender low default rates and therefore high bank profitability. so why do lower rates equal a decline in interest income. i really don’t understand ,if your point is simply that the banks want it to go up so that there borrowing costs go up……..just so that there is space for it too go down again. Jake, I’m not sure why you’re taking Libor as the reference rate. Retail banks don’t fund themselves this way. Interbank deposits rarely represents more than 20% of banks’s funding structure. And even within this 20%, only a small share of this is short-term. The reason is that deposits, mostly demand ones, are cheaper than money market funding. Deposits often represent 60 to 90% of banks’ funding. What you’re missing is that, in normal conditions, banks pay LESS than the BoE rate on demand deposits, and around BoE on saving ones (but often below too). So the negative spread between the deposit rates and the BoE rate all but disappear when we approach the zero lower bound. Banks average loan rate is 6%, the average rate paid on deposits is 1%, and the BoE rate is 3%. The margin here (ie, the spread between interest income on lending and interest expense on funding) is 6% – 1% = 5%. Now the BoE lowers its rate to 1%. Lending is variable rate, and declines by 2% to 4%. Deposit rates however can’t maintain the 2% negative spread they used to have with the BoE rate ( although this is now being challenged as some banks in a number of countries are now applying negative rates). They stop at 0%. Now the margin has become 4% – 0% = 4%. There has been margin compression due to low rates. If rates go up, it’s likely that lending rates are going to increase, but that banks are mostly going to maintain deposit rates as they are now, in order to rebuild their margin. okay I get that funding will come maily from deposits,my bank just informed me it reducing the interest from 1.14 to 0.50 recently,although I was assured that this was still market competitive. The BOE rate is the amount paid on reservers held at the BOE.right? 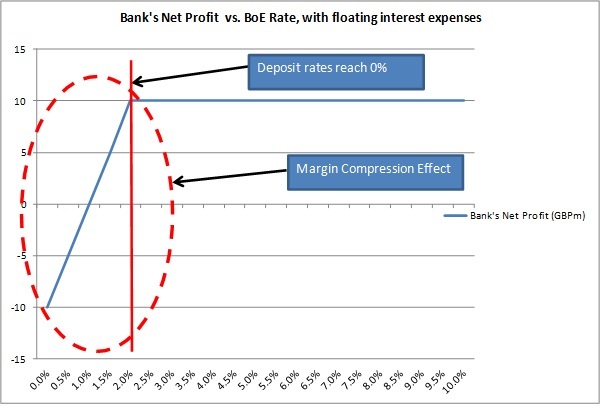 i think i get it,as long as we are only talking about mortages which are linked to the boe rate.from the graph you show (the first one),their is a healthy difference of 2 between the boe rate and deposit rate for about ten years until 08-09.where it squeeze down to less than 1. So I guess what I don’t understand is why do banks link mortages interest charges to the BoE rate through tracker mortages when the BoE rate has no relationship to funding costs for the bank. Banks have to define a benchmark for their variable rate lending. In the UK it’s most of the time the BoE rate (which is the refinancing rate btw), but in many other countries it is the Libor/Euribor (although in the end it’s quite similar as those two rates are supposed to remain within a certain range of the target rate of the central bank). Those rates are effectively the most ‘risk-free’ rates you can get on the market. When banks lend at fixed rate, they get squeezed when interest rates rise. Like if they lend at 2% fixed, and the risk-free rate rises to 5%, the bank is wasting its funding sources on unprofitable lending. With variable rates, banks remain protected against rate fluctuations. And the BoE rate has impacts on the bank’s funding cost. As the BoE targets short-term rates, it adjusts them by purchasing/selling securities on the market and lending to banks. It in turns affects the whole yield curve, in part due to expectations of the level of future short-rates.